CBO: Repealing Health Coverage Mandate Would Save $338 Billion : Shots - Health News Republicans have been toying with repealing the Affordable Care Act insurance mandate in their tax bill. The Congressional Budget Office says that would save money but make coverage much more costly. 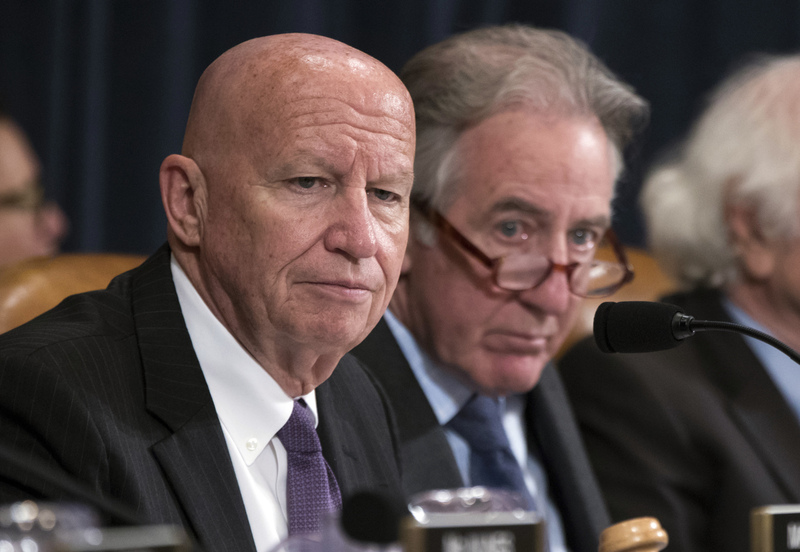 House Ways and Means Committee Chairman Kevin Brady, R-Texas, and Rep. Richard Neal, D-Mass., listen to debate on tax reform on Wednesday. But that savings would come with 13 million fewer people having insurance coverage by 2027, CBO analysts say. Some of those people would not want to buy insurance, but others couldn't afford it. The CBO also predicts that average premiums would be 10 percent higher in most years than they would be under current law. House Republicans are toying with the idea of repealing the so-called individual mandate — a key part of the Affordable Care Act — as part of their plan to overhaul the tax code. Including the provision could be a win-win for Republicans. The move would allow them to offset more of the tax cuts they want in their tax plan and give them the chance to claim they repealed one of the most hated parts of the Affordable Care Act, also known as Obamacare. "That depends upon through what prism you look at the issue," says Chris Jacobs, a health policy analyst at Juniper Research Group. "As a matter of tax policy, including $338 billion in additional revenue to pay for tax reform is a positive outcome. But as a matter of health policy, repealing the mandate without repealing any of Obamacare's insurance regulations will raise premiums." House Speaker Paul Ryan has said repeatedly that one of his goals in repealing the Affordable Care is to make insurance cheaper and give people more choices. President Trump has pressed lawmakers to include the repeal of the individual mandate in the tax overhaul plan. He took to Twitter on Nov. 1 and mused that it would be "great to Repeal the very unfair and unpopular Individual Mandate in ObamaCare." But on Monday, House Ways and Means Committee Chairman Kevin Brady said he is not inclined to add health care policies to the tax bill. The new CBO report is an update of an estimate from last December that concluded that repealing the individual mandate would cut the deficit by about $416 billion over 10 years. An earlier version of this story said the CBO predicted 10 percent annual increases in premiums if the individual mandate is removed. The agency predicts that average premiums would be 10 percent higher in most years.